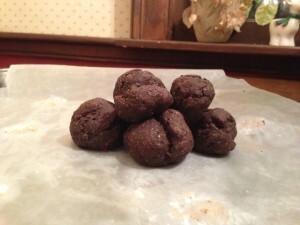 I made some rather unappetizing-looking cookies …. But they were roommate approved ! I took advantage of the (brief) upswing in temperatures here in the Midwest on Saturday to ride Newman outside in the snow. I try to get a “snow ride” in at least once each winter but it seems like Mother Nature doesn’t have the same goal. It’s either too cold (below zero with wind chills in the negative numbers), too warm (just above freezing where the top layer of footing is a slick, muddy mess), or there’s no snow. This weekend was perfect—a couple of inches of snow on the ground and flurries during our ride. Too bad I don’t have a sleigh for Newman to pull! Snow did not slow us down on the cape this weekend. We took advantage of the scenery to capture some nice photos and to let our horses have a little fun! This weekend I spent some quality time at the barn with my new horse Sasha. She’s green and we’re still getting to know each other, so I was really happy with how well our lesson went on Saturday. Our flatwork is getting better and we had fun working through a little gymnastics exercise. It was a huge improvement over the previous weekend’s lesson, which was more than a little rough around the edges! Friday I drove my horse trailer 4.5 hours to New Jersey, stayed in a hotel and picked up a new horse on Saturday morning. We were on the road by 7:30am, as I was trying to beat the incoming storm. Unfortunately for me, the majority of the ride home it was snowing. Getting home took 5.5 hours, so overall not too bad. I let “Asterisk” settle in for the rest of Saturday. He is at my farm on a 4 month lease so I can try him out. 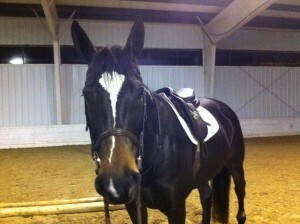 He is a very sweet, very happy 4-year old warmblood. Sunday morning I lunged and rode him in the indoor. It was a very uneventful first ride (a really good thing for a youngster). I can’t wait to ride Asterisk a bunch more this week! 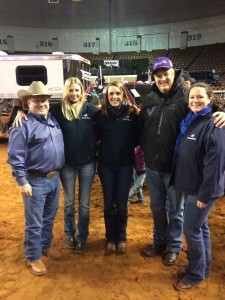 Last weekend, I was in Oklahoma City for the NRHA Futurity with SmartPakers Lissa, Becki, and Carolyn. The Futurity is my favorite show of the year and despite the record breaking cold weather in Oklahoma that week, we had a great time. It was particularly exciting to see Mandy McCutcheon win the Non Pro Futurity and to spend some time catching up with Team SmartPak riders Tim McQuay, Tom McCutcheon, and Matt Mills! Had a jump lesson in which my mare was disinclined to pick up her toes. I realized when I got home that every hoof had a different color on it from knocking rails. Luckily she was much improved by the end of the lesson! This weekend was a snowy one, which definitely got me in the mood for Christmas! It wasn’t a particularly eventful weekend, but I did have a few pictures you guys might enjoy. From left to right: during a stroll in the snow, I spotted the most adorable tracks I’ve ever seen. I’m guessing squirrel or raccoon, but I’m no tracker, so don’t take my word for it. Next, I decorated my tiny, living Christmas tree (very gently – I’m hyper-concerned about damaging his young branches!). Last but not least, my boyfriend and I bored our dog to tears playing Bananagrams on Sunday night. Happy Holidays! This weekend I spent lots of time visiting my animals and then trying to get warm afterwards! 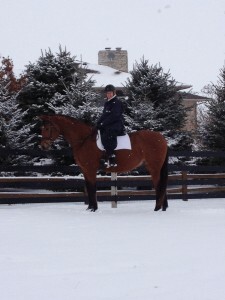 On Saturday I snuck in a quick ride on my mare Luna before the snow came. Luckily we have an indoor so even though the flakes started falling during my ride, I was still able to stay dry. Afterwards I spent a few hours at work talking to our wonderful customers, and then went to a friend’s Christmas party. On Sunday I went to visit my retired horse Riker (despite some icky weather), rode Luna again, and finished up some more Christmas shopping. All in all it was a productive weekend, despite the snow/sleet/rain/ice combination of weather!